Unit 8: Forces and Motion: All New-Tons of Fun! LESSON 1: Can You Track The Sun's Energy? LESSON 7: Airport Design Advice: Engineers Needed! Connecting to the Essential Question: What are you supposed to learn today? Students will be able to analyze weather maps in order to make predictions about weather and climate. Students analyze weather maps as they develop their own understanding of the relationships between air pressure and clouds, factors that influence climate, weather fonts and the jet stream! MS-ESS2-4 Develop a model to describe the cycling of water through Earth's systems driven by energy from the sun and the force of gravity. Analyze and interpret data to provide evidence for phenomena. Patterns: Observed patterns in nature guide organization and classification and prompt questions about relationships and causes underlying them. Patterns in rates of change and other numerical relationships can provide information about natural and human designed systems. I begin every class by asking the students, "What are you going to learn today?". Students respond by referring to the Essential Question, "How can I demonstrate science and engineering literacy?". This EQ is included on their Unit Plan and on the front board. As the previous lessons in the unit have been designed to help students work towards mastery on the skills in the Unit Plan, I ask students to reevaluate their self assessments from the previous day. Students rank themselves on each of the skills included in the Unit Plan. Students rank themselves on a scale of 1 to 4 (4 being mastery). Students will continue to update these scores over the course of the unit. I emphasize to them that it is ok not to be at a "4". Learning is about growth! We will use this starting point to track the growth in their learning. Notice in the student work below, that the student updates his scores over the course of the unit as he grows in his level of mastery. Explain to students that they are going to be analyzing weather maps in order to identify patterns that occur in weather and learn to make predictions based on those patterns. Explain that they are going to be looking at a large number of maps during this lesson so it will be important that they analyze these maps like a scientist. 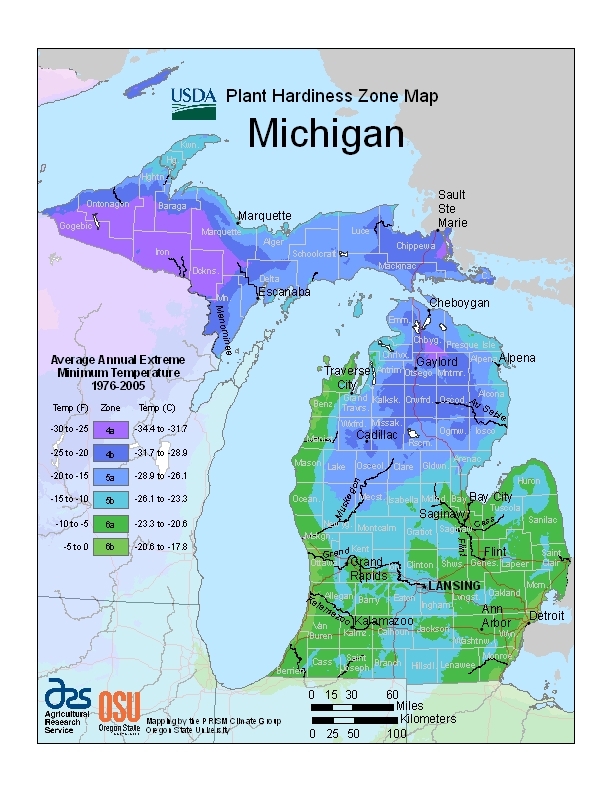 Project the Plant Hardiness Zone Map below. (The USDA has these same maps for your state as well!) 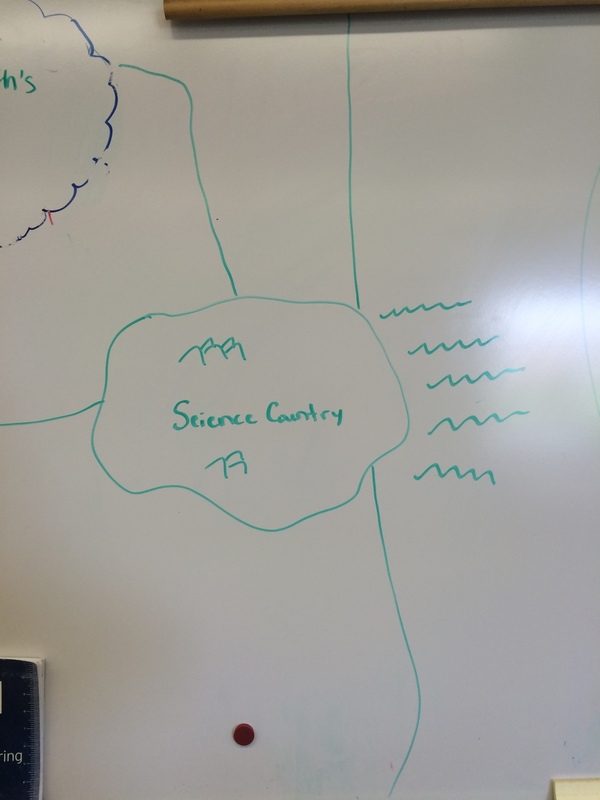 As a class, brainstorm things that scientists might do when analyzing this map. Ask the students, "What would a scientist do first?". 1. Read the title to determine what the map is about. 2. Determine the author (if available) to get a sense of the purpose of the map. 3. Look at the key - What are the units? What is the scale? 5. Use science knowledge or text to figure out "why" the patterns you see exist. As a class apply these ideas to the map below. When you get to #4 on the list, emphasize that scientists do not simply look for one pattern - they are looking closely for all patterns they can see. 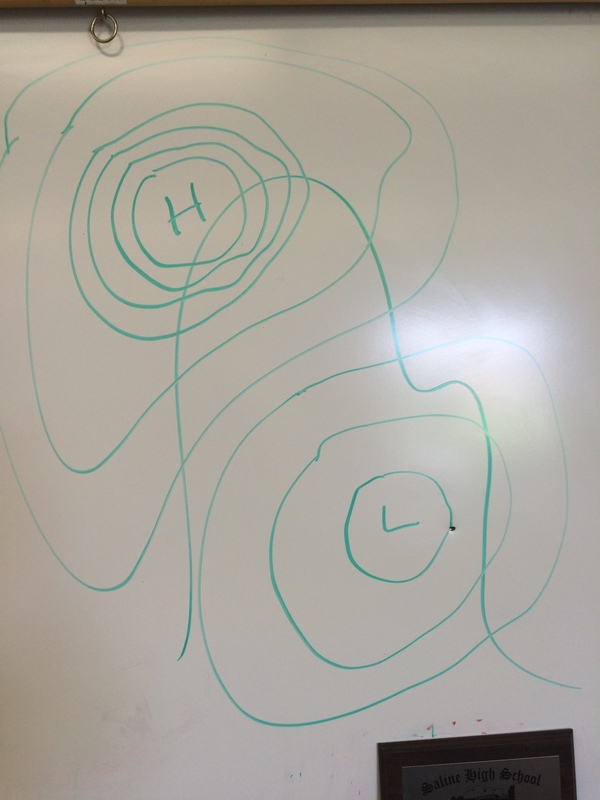 With this map in particular (and they will use this map in the upcoming activity), students quickly see that as the latitude increases, the annual low temperature becomes more extreme. However, many of them will stop there. Ask students to find more patterns than the relationship between temperature and latitude. Upon a closer look, students should see that the warmest of the low temperatures are along the shores of the Great Lakes while the most extreme temperatures are inland, landlocked areas. Then, before completing #5, explain that in the upcoming activity they will be determining the "why" for this pattern themselves. Encourage them as they analyze maps throughout the next two days, that they should slow down and use these steps for each map they encounter! Have students go to this Weather Forecasting Website. This website and online activity is accessible from devices as well as laptops. So, if you don't have the technology in your classrooms for every student or pair of students, students can use their devices! Explain to students that they will be following the directions on the website to complete their Weather Forecasting Packet. Show students that the packet is broken down into sections that correlate with the directions on the website. Emphasize to students that they must follow the directions on the website exactly. For example, the directions may say, "Click on the link and analyze the weather map. Then, answer questions 1 and 2 in Section A." In this case, if a student clicks on the link and then tries to answer all of the questions in Section A, they will get confused when they read question 3 because that question is relating to a different weather map. 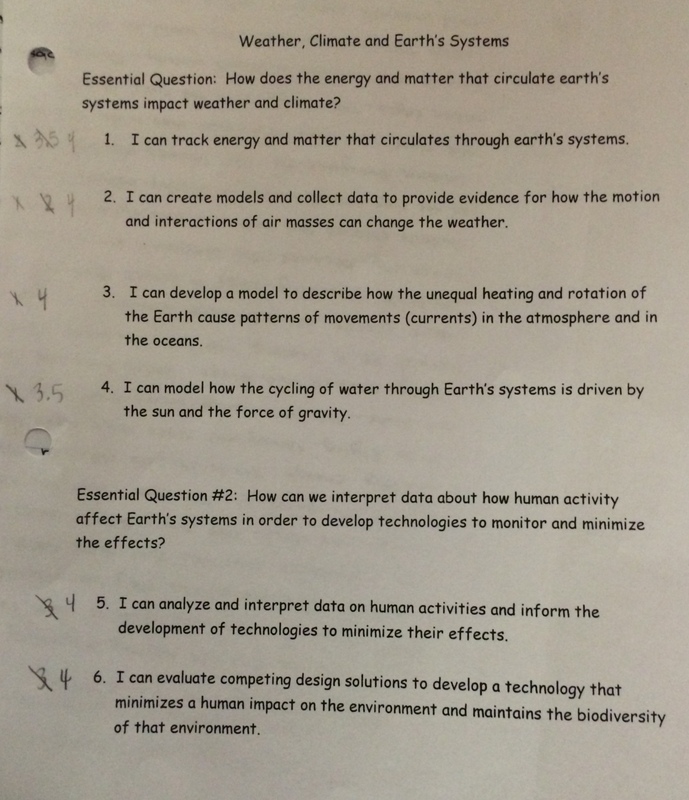 If the directions ask students to only answer questions 1 and 2, it is important that they go back to the directions after answering those two questions. That might seem self explanatory, but I can tell you that the middle school brain needs this reminder! The website is a compilation of links to articles about weather and climate as well as links to live weather maps. That means that the maps will change with the day, and even with the hour. So, your students' answers will vary. Below is a short synopsis of the key points students should take away from each section. Here is one of my student's completed work as well. First, students read an article about factors that influence climate such as elevation, latitude, and distance to water. Students analyze a map of elevation in the US compared to a map of the average temperatures in the US. Students find that there is a correlation between elevation and temperature and that areas at higher elevations tend to have colder temperatures. Then, they analyze a map of Michigan that shows extreme cold temperatures. Students find that the most extreme temperatures are found north and inland while the most mild, stable temperatures are found in southern Michigan and along the shores of the Great Lakes. Students begin developing the idea that areas near water are warmer in the winter and cooler in the summer than areas that are landlocked. In this section, students learn about isobars and use their knowledge of air pressure to make predictions about wind speed and direction using isobar maps. This section first asks students to predict where cloud cover would be located based solely on an isobar pressure map. The goal is that from previous lessons involving air pressure, that students are aware that areas of low pressure, rising air would result in cloud cover. Then, students look at satellite maps to see if their predictions are correct and can clearly see that low pressure areas have cloud cover while areas of high pressure have clear skies. In this section, students compare isobar maps, frontal maps, and rainfall maps to determine a relationship between where areas of rainfall are in relationship to pressure systems and frontal boundaries. Here, students compare regional front maps to a looping interactive map showing the movement of clouds to analyze how the movement of the clouds is connected to frontal boundaries. In this section, students watch a video and read articles as they gain knowledge and information about how the jet stream impacts weather patterns. In this section, students compare maps that show regional fronts and compare the "shape" of the frontal boundaries to the "shape" of the current jet stream. Students see that the shape of the jet stream is similar to the large frontal boundaries across the US. Then, students make predictions about where they feel the cloud cover in the US will be in 3 days. 1. How could you use an isobar map to predict the wind direction and speed? In this discussion, students should identify that the wind would move from high to low pressure and that the closer the isobars are together, the faster the winds would be. 2. How could you use an isobar map to predict where the cloud cover would be? After completing this activity, students should recognize that areas of how pressure tend to have cloud cover while areas of high pressure tend to have clear skies. 3. Why do areas of lower pressure often have cloud cover? Students should recognize that areas of low pressure tend to have cloud cover because they have less dense, rising air. When this air rises, it cools and condenses, forming clouds. 4. Why do areas of higher pressure often have clear skies? Areas with higher pressure tend to have clear skies because there is not rising air. One important distinction to make with students is that higher pressure doesn't mean "cold". It simply means that the pressure is higher than the area surrounding it. This means it could be a high pressure area but still be what they would consider "hot". The idea is that if the air has higher pressure, it is more dense and thus would not be rising. Be sure to clarify with students this idea if you hear them saying "high pressure means cold". 5. If you wanted to predict where the clouds would move in 3 days, what type of information, data, or maps would you look for to make that prediction? One key to this discussion is that students recognize that in order to predict where fronts are moving, one must have an awareness of where the jet stream is. Students often can quickly come up with the idea that they would want an isobar map showing pressure and fronts; however, including the jet stream is something that can be more challenging. 6. How does the placement of the jet stream affect yearly weather patterns? This question ends up being a challenging one. This activity, for most students, is their first time learning about the jet stream. It requires them to go back and look at text. For middle school students, they need encouragement to do this. In the video above, you will notice that at the end, a student actually asks me if it would be ok to look back at the text. This clip is not the entire discussion; I included it so that you can see the importance of encouraging students to go back and search their text for answers when they need to. 7. Look at the screen. (I project on the screen this map that shows the locations of the fronts and the jet stream in the US.) What patterns do notice between the jet stream and the locations of the fronts? This question is challenging for students. Not only is this their first time learning about the jet stream, but comparing and finding patterns between two maps can cause some struggles. In the video above, I talk through and show some of the connections I hope the students make between the weather maps. 8. Why do you think that meteorologists can’t exactly predict the weather? Why can they only give us a “probable” prediction? 9. If you were moving to a new country and you wanted to live in a place that had stable temperatures (didn’t have a huge range of temperatures throughout the year), where would you look to move? 10. If you were moving to a new country and wanted to avoid extremely cold temperatures at all costs, what region of the world would you look to move to? Once you have picked a region you would like to move to, where within the country you choose would you want to move? Why? In this question, students should recognize that they should move to an area near the equator. After determining that consensus, the conversation can take different paths. In this example, students debate whether they should move inland or along the coast. One student offers that they should move inland because she knows that extremely hot temperatures could occur inland. Another student offers that they should move along the coast because while an inland area could have extremely hot temperatures, there is also a greater likelihood for the temperatures to get more extreme on the cold end. There is merit to both of these claims and it is interesting to see how each group determines what they feel is correct. This group ends up deciding that along the water would be the best choice. For some groups, they offer that inland is still the best choice because even though it could have the most extreme cold temperatures, due to the fact that they are at the equator, the temperatures will never really get that cold. These groups also offer that in the summer, if they live along the water it will be cooler than it would be inland. 11. Your cousin from Florida is moving to Michigan and is nervous about the cold temperatures. What advice would you give him/her about where not to move to in Michigan? These students quickly note that "your cousin" would not want to move towards the poles. To really show understanding of factors that influence climate, it is also important that they discuss whether the cousin should move inland or along the coast. These ladies do this very effectively as the recognize the cousin should move to a location along the coast where the extreme low temperatures will be more mild. 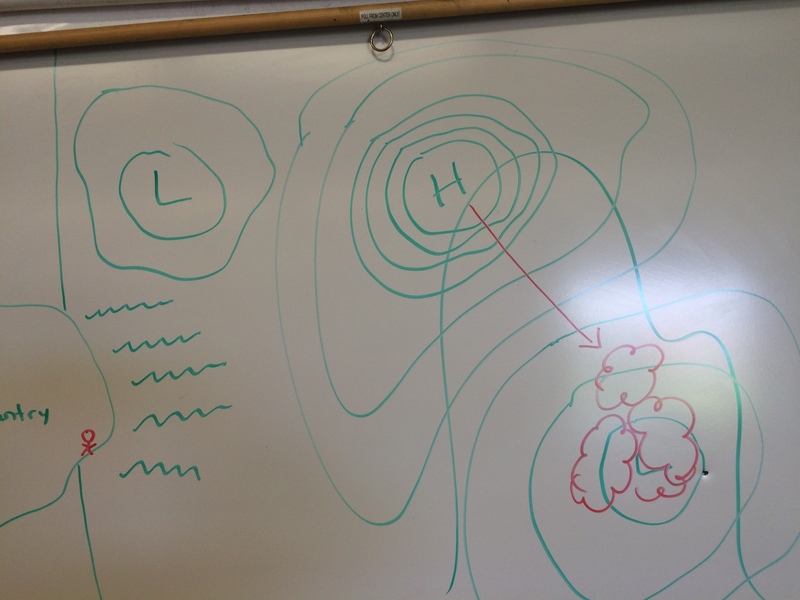 I then ask a student to come up and draw on the map where they would predict the cloud cover would be. I ask a different student to come draw an arrow the direction the wind would be moving and to point out where the fastest winds would be. Finally, I draw a new low pressure system northwest the high pressure area as shown above. I say, "I know that wind moves from high to low pressure. Now, I have an "H" in between two "L's". How will I know which way the wind will move now?" Students should explain that because of the direction the jet stream is moving, the winds would still probably be moving southeast. 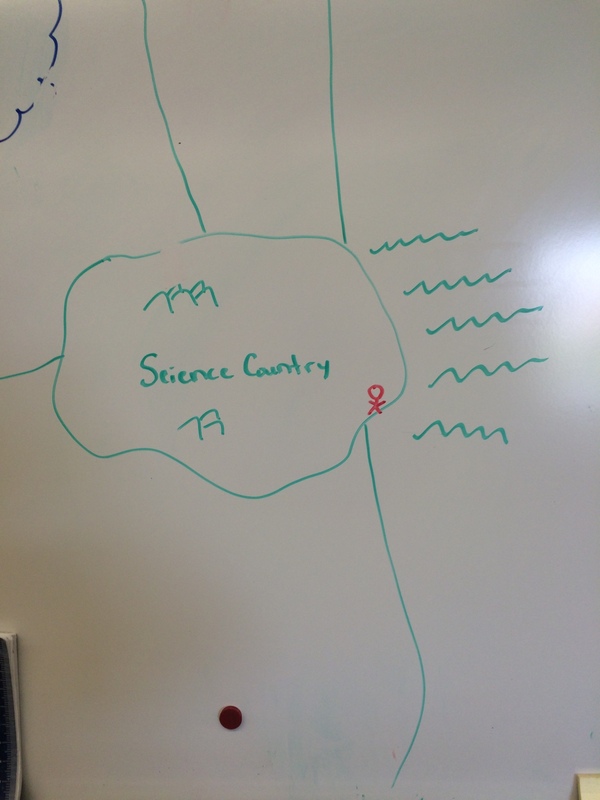 Then, I show students this picture of "Science Country". I say, "You are graduating from college and are looking for your first job in 'Science Country'. You loved your upbringing in Michigan so you want to make sure that wherever you move you still get to experience the -30 degrees Fahrenheit temperatures that we have experienced this winter. Where should you look to live in this country?" I give one person a marker and have them draw a stick figure on the map that would best fit these requirements. After the student draws their figure, I ask different students to back up the student's choice with reasoning. Students should offer that location has a high latitude, high elevation, and is landlocked/inland and thus would have the most extreme temperatures. Then, I change the story, "Let's face it. The unpredictable weather in Michigan can be frustrating. We never know what the weather is going to do and it is always changing. We can have a day where the temperatures swing 40 degrees! Because of this, you want to move to a place that would have very consistent temperatures, where the temperature doesn't vary greatly and you can avoid those frigid temperatures of Michigan winters. 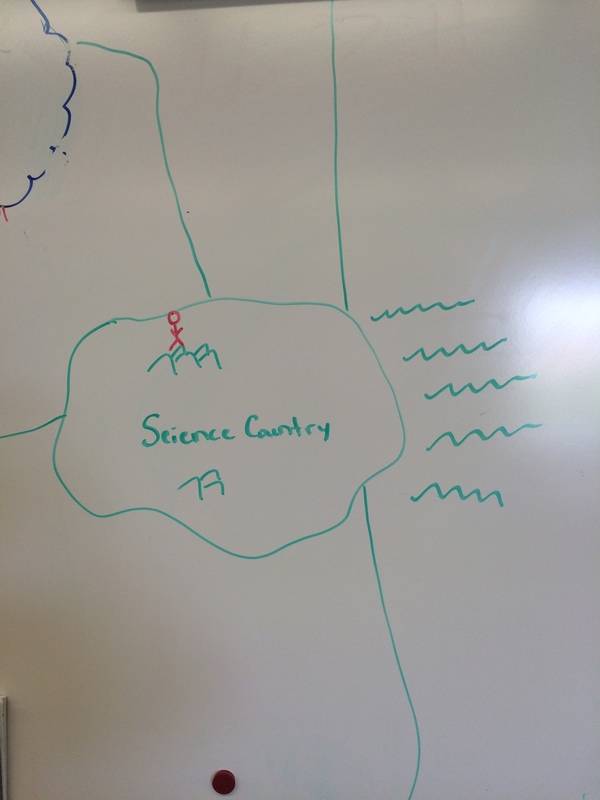 Where would you move to in 'Science Country'?" Again, after the student draws their figure, I ask different students to back up the student's choice with reasoning. Students should offer that location has a low latitude, low elevation, and is near water and thus would be cooler in the summers and warmer in the winters.